మినప్పప్పును నాలుగైదు గంటలు నానబెట్టి నీరంతా ఒడ్చేయాలి. ఇందులో అల్లం, పచ్చిమిర్చి ముక్కలు వేసి మెత్తగా రుబ్బుకోవాలి. ఇందులో సన్నగా తరిగిన క్యాబేజీ (పచ్చిగా లేదా వేడినీళ్ళలో వేసి తీసినా సరే ) , కరివేపాకు, కొత్తిమిర, జీలకర్ర, ఉప్పు వేసి బాగా కలియబెట్టాలి. నూనె వేడి చేసి ఈ మిశ్రమాని వడలుగా వత్తుకుని ఎర్రగా అయ్యేవరకు నిదానంగా కాల్చాలి. టమాటో లేదా కొబ్బరి చట్నీతో సర్వ్ చేయండి. 1.De-shell the prawns and wash them. 2.Marinate them with all the ingredients for 30 mins. 3.Place a pan on flame and add oil to shallow fry it on a low flame. 5.Turn the prawns and leave it to cook for another 5 mins. Whip the yogurt until smooth.Keep aside. Heat ghee in a skillet.Add mustard seeds and let them splutter. Now add cumin seeds,asafoetida,curry leaves.Fry for 10 seconds. Now add the chopped green chillis,grated ginger and onions.Fry for 2-3 minutes. Add turmeric powder and grated carrot,coconut and fry for 4-5 minutes. Stir constantly so that it doesnt burn. Remove from fire and cool. Sift the flour and add salt, egg and water and make a smooth batter. • Heat little ghee in a pan. • Add pista and almonds. Fry until light golden colour. • Pour this ghee into the flour. • Add soda and little water. Make soft dough. • Cover it with a wet cloth for 15 minutes. • Take water and sugar in a saucepan and boil it to make thick syrup. • If the syrup becomes thick, add water and heat it again. 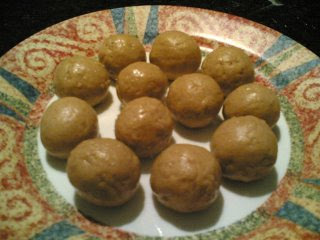 • Divide the dough and make small sized balls. • Flatten slightly and make a hole in the center. • Prepare all the badhushas. • Heat oil over medium flame. • Deep fry the badhushas until golden brown. • Put them immediately into the sugar syrup for about 5 to 8 minutes. • Place them on a plate. 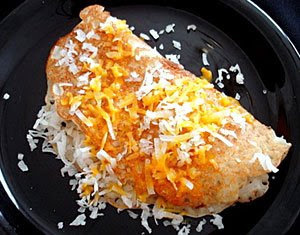 • Sprinkle fried nuts and grated dry coconut. • baadusha is ready to serve. Take a heavy bottom flat vessel. Add the ghee. Fry the cashew till golden brown and remove. Add the raisins and stir for a minute and remove. Add the vermicilli and roast till golden brown. Add more ghee if required. Add the sugar and stir for 5 minutes. Be careful that the sugar does not stick to the vessel. Add the milk and stir on low flame. Take another pan and boil 3 cups of water. Off the gas and add the sweetened condensed milk to the water and dissolve it. Meanwhile the milk would be boiling. Check if the vermicilli is cooked. Do not over cook it. It should be just done. Add the diluted condensed milk and keep on stirring. Check the sweetness. Add more sugar if needed. Keep on stirring till the mixture starts getting thick. Turn off the gas. Add the fried cashew nuts and raisins. Add the cardomom powder and keep covered. Can be served hot or chilled. 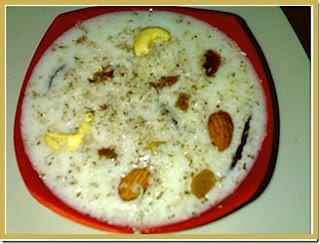 If the mixture gets thick add some boiled milk to the payasam. 1.Combined chicken, soy sauce (2 tbsp), egg white, corn flour (3 tbsp), cabbage, green chili sauce (1 tbsp), tomato ketchup (1 tbsp), garlic (1 tsp), ginger (1 tsp), white pepper (1/2 tsp) and salt (to test). 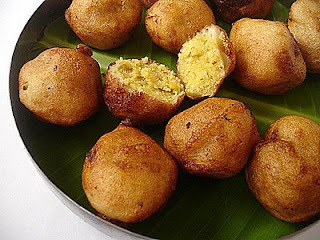 2.Make small balls out of this mixture and deep-fry them in hot oil till golden brown. 3.Heat 1-tablespoon oil in a wok. Add chopped onions, garlic and ginger. Fry them for 3-4 minutes. 4.Now add soy sauce (2 tbsp), tomato ketchup and green chili sauce (2 tbsp). Mix them well and add 2 cup of water. 5.When water starts boiling, add chicken balls and MSG and cook this for about 4 to 5 minutes. Add chopped green chilis. 6.Mix a tbsp corn flour in ½ cup of water and slowly add while stirring; cook for about 2 to 3 minutes. 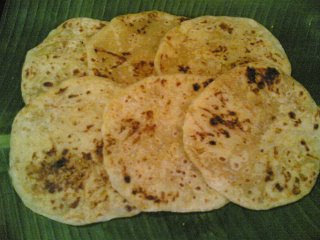 7.Garnish with chopped spring onions and serve with steam rice or Indian breads: poori, paratha and naan. 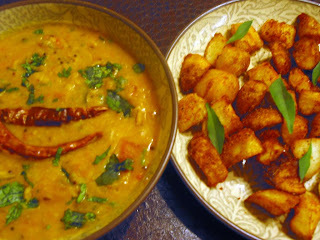 - Take them all in a pressure cooker and cook until the dal reaches fall apart stage. Usually takes about 10 to 15 minutes in a pressure cooker. Once the valve pressure is released, remove the lid and add about half teaspoon of salt. Mix and mash the dal to soft consistency with a wood masher. In a separate vessel, do the popu or tadka (toasting cumin, mustard seeds, curry leaves etc in oil). 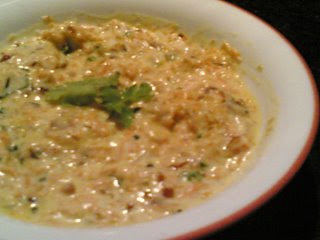 Add the mashed tomato dal to the popu. 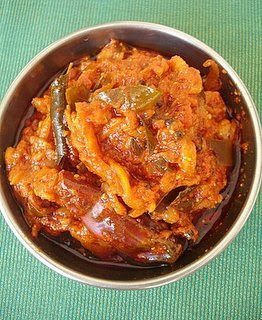 Mix and serve hot with rice or with chapati. 1.Dissolve the sugar in the water and heat it. 2.Keep stirring till you get a thread consistency. 3.You can check for this by feeling the syrup between your fore-finger and thumb. (If the syrup has reached the required consistency, then you will able to pull it out like a thread). 4.Remove all the lumps in the chick-pea flour and add it to the syrup, 1 table spoon at a time. 5.Reduce the heat and add 2 teaspoons of ghee. 6.Stir, till the flour and ghee has completely blended with the syrup. 7.Repeat procedure 2 till you finish all of the besan. 8.Continue to stir and keep adding ghee 1tsp. at a time till the mixture changes color and texture. At one point, you will observe that the mixture is not able to absorb any more ghee. Also, the whole mixture becomes porous and starts leaving the edges of the vessel. 9.At this point, transfer the mixture into a greased plate and with a spatula press the mixture down till the excess ghee surfaces. Do not remove the excess ghee. 10.Allow it to cool for 10 minutes. Then, cut it into desired shape and wait for another 10 minutes. Carefully remove each piece and arrange on the serving tray. 1. heat kadhai, add 1 tb sp of oil. Add chana dal, urad dal, choppped ginger, garlic, cloves, elaichi, cinanmon and fry for 3 minutes in low flame. add sesame seeds and fry till golden brown. switch of the flame, allow the mixture to cool and grind them to a tight paste adding little water if necessary. 2. Wash brinjals thoroughly in water and remove the stems. slit them in a plus shape. 3. Divide the ground paste into two halves(one for stuffing and the other for gravy).Carefully stuff the ground paste into each brinjal. use your left hand to separate the slits and stuff the paste with your right hand fingers slowly so that the brinjals do not break. 4. 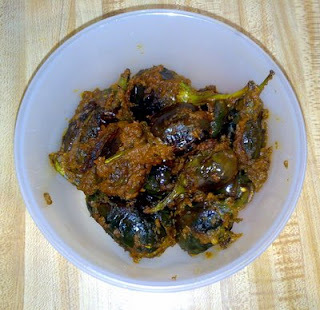 Heat 3 tb sps of oil in a kadhai, add curry leaves, and drop stuffed brinjals slowly. stir them for a few seconds gently and cover the pan with a lid. keep stirring occassionally and cover it with the lid again. Do this till the brinjals turn soft. 5. remove the lid, add the remaining portion of the ground paste, turmeric powder, chillie powder, salt,water and mix gently so that brinjals do not break. 7. Garnish with corinader and serve hot with steamed rice. 1. Clean & wash the prawns well. 2. 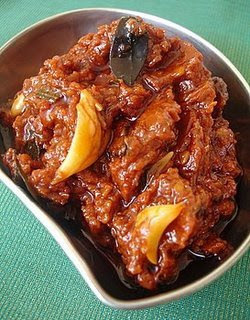 Grind coconut, dry red chilly, coriander seeds, pepper corns, ½ onion, tamarind, water as required and make a fine paste. 3. Marinate the prawns with little turmeric powder and salt. 4. fry the prawns till it is ¾th done, then keep it aside. 5.Fry the remaining half onion. add ginger & garlic paste, slit green chilly. Fry well then add the above masala paste. 6.Fry the above masala well then add required amount of water, salt, garam masala powder. 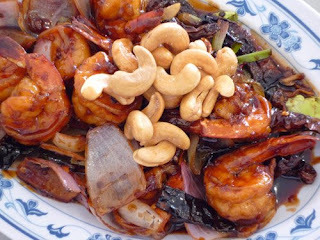 7.When it boils add the fried prawns, cook till the prawns are done. Combine mango pieces, red chilli pwd, mustard pwd, methi pwd, salt and oil in a vessel.Heat 1/2 tbsp oil in a vessel, add mustard seeds and let them splutter. Add methi seeds, dals, red chilli and stir fry till the dals turn red. Add curry leaves and asafoetida and stir fry for a few seconds before turning off the heat.Pour this seasoning over the mango mixture and combine well. Store in a clean, dry bottle and refrigerate.This pickle can be eaten within two to three hours of preparation. Heat two tsps oil in a cooking vessel, add green chillis and fry on medium heat for 4-5 mts,stirring it constantly. Remove from pan and cool.In the same pan, add the capsicum pieces and stir fry on medium heat for 3 mts. Remove and cool.Once cool, grind the sauteed green chillis, capsicum and tamarind paste to a coarse paste. Keep aside.Add the remaining oil to the cooking vessel, add mustard seeds and let them pop, add cumin seeds and dals.Let the dals turn red, add curry leaves and dry red chillis. Add the asafoetida and stir fry for a few seconds.5 Add the sliced onions and fry for 4 mts or till they turn transparent.Add the ground capsicum-green chilli paste to the sauteed onions and stir fry for atleast 15-18 mts on low to medium flame.Add salt and combine. Ensure that the capsicum-green chilli paste is thoroughly fried in oil.This pachadi stays fresh for a few days if stored in the refrigerator.Serve with hot rice and a dollop of ghee. Oil to make it - 1 cup. Method of preparing Patishapta: Make a batter of all ingredients and keep aside for 10 minutes. Heat a kadai. 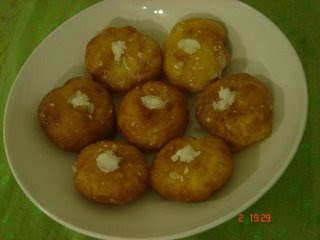 Add jaggery, and after melting it add coconut and cook untill it makes a sticky dough like mixture. Cool it. Heat a pan. Add 1 tsp of oil and spread it. Put some batter in the pan and spread it lightly. It makes like a pan cake. Stuff the coconut pur and rolled it. Serve hot. 1. Let eggs and butter stand 30 minutes. Preheat oven to 350 degrees F. Line 28 2-1/2-inch cupcake pans with paper liners; set aside. 4. Spoon batter into prepared pans, filling each about two-thirds full. Bake 15 to 17 minutes. Cool in pan on wire rack for 5 minutes. Remove from pans. Cool completely. Top with small chocolate cookies, if desired. Dust with powdered sugar. Makes 28 servings. Method: Mix ingredients for filling. The mixture should be soft and crumbly. Mix ingredients for cover. Using water knead to a pliable dough. Cover with a wet cloth. Keep aside. Boil sugar and water adding a tbsp. of milk to clear the syrup. Boil till the syrup is slightly sticky between the fingers. Strain. Crush and add the saffron. Keep aside. Make 15 to 16 flattish balls of the mixture. Divide dough also into 15 to 16 parts. Roll one part into a puri, place one mixture ball in the centre. Pull up all the sides to seal the mixture and press in centre. Make 5 to 6 such kachoris, heat ghee and fry on low flame till light brown, turning once. Repeat for remaining kachoris. When slightly cool, make a hole in the centre of each (approx. 2cm. diameter). Pour about half tbsp. of syrup and roll kachori around to let the syrup spread. Allow to stand for half hour before serving. Method: In the microwave place a corning ware dish with 1 stick of butter and melt it for 1 minute. Remove, then add all ingredients mix it to the melted butter. Keep it back in microwave for 5 minutes. Let it cool for a 1 or 2 minute then cut into pieces. Serve it warm. Soak rice for 15 minutes. Allow the milk and coconut extract to boil, add the soaked rice and cook. After it is cooked, add sugar, cardamom powder and almonds and let it boil for 5 minutes. Add the evaporated milk and let it boil. Mix milk, rava and sugar heat to boil. Then keep on stirring in medium heat until it becomes thick. Now add ghee and stir it becomes non-sticky. Pour in a large plate and cut into diamonds. Mix refined flour,pinch of salt,2 tbsps oil and enough water to make a very soft and sticky dough.Knead well. Grease your hands with oil to knead the dough and take a small portion of dough and flatten it into a disc of the size of your palm. Place a ball of “sweet lentil ball” in the centre and draw the edges of the dough from all sides to cover the ’sweet lentil ball’ completely. Take a sheet of transparent plastic wrap or a plaintain leaf and gently flatten each ball carefully with your fingers to form a 6´´ to 8´´ diamater flat circular bobattu/poli (grease your hands while flattening).Fry it on low flame on a hot griddle or tawa.Roast both sides till brown spots appear. Smear with ghee on both sides when done.Serve warm with clarified butter/ghee. Drain water from the black gram dal and rice and grind to fine paste adding very little water.It should be like a thick dosa batter. Add a pinch of salt and mix well. Leave aside covered.Cook bengal gram with just enough water to cover the dal. The dal should be just cooked and hold shape.Drain any left over water from the dal after its cooked. Add jaggery or sugar to the dal and use a masher to mash them together till it blends well.Take a heavy-bottomed vessel and add the ground dal paste and cook till it appears like a thick paste,stirring continuously as the dal tends to stick to the vessel. Turn off heat and cool.Add grated coconut, cardamom powder and mix well. 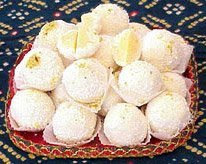 Shape small bite sized balls like shown in the picture above. Heat enough oil in a wide heavy bottomed vessel for deep frying the balls. Dip each ball in the batter and let it coat evenly and place in the oil and deep fry till golden brown and crunchy.You can deep fry a batch of four to five balls depending on the size of the vessel.Serve warm. Store in an air tight container as they last for at least two days. Sift both flours together. Heat ghee in a heavy saucepan. Add flour mixture and roast on low till light golden. Keep aside to cool a little, stirring occasionally. Prepare syrup simultaneously. Make syrup out of sugar, water and milk. Bring syrup to 2 1/2 thread consistency. Pour at once into the flour mixture. Beat well with a large fork till the mixture forms threadlike flakes. Pour onto a greased surface or thali and roll to 1" thickness lightly. Sprinkle the charmagaz seeds and elaichi and gently press down with palm. Cool, cut into 1" squares, wrap individually into square pieces of thin plastic sheet. Store in airtight container. 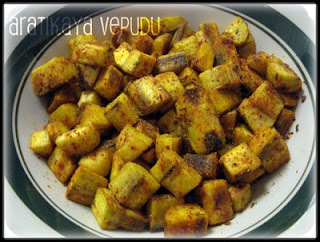 Take a wide plate and combine all the dry masalas except garam masala and saunf pwd with sliced onions and plaintains. Heat a cooking vessel and add oil.Add mustard seeds and let them splutter.Now add the cumin seeds and curry leaves.Fry for 10 seconds. 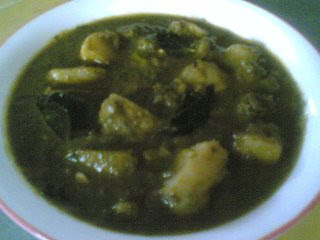 Add slit green chillis and add the plaintains which have been combined with the masalas.Add grated coconut.Combine well.Sprinkle 1/2 cup of water and cover and cook.Let the plaintains cook in the steam.Once in a while stir.Add the garam masala pwd ,saunf pwd and adjust salt towards the end of the cooking.Once the plaintains are cooked till soft remove from heat and serve with hot rice. Peel the cucumber. Halve lengthwise and remove the seeds. Cut into chunks about 1cm thick.Chop the spring onions diagonally into 1cm lengths. Place with the finely chopped red onion and cucumber in a bowl. Whisk together the fish sauce, lime juice, oil and chilli flakes and pour over the vegetables. Toss well to mix.Line a serving dish with the salad greens then tip on the cucumber salad and sprinkle over the coriander. • Rinse and immerse the horse gram overnight in water. • Boil the lentils over a low fire till soft. • Strain and separate the lentils into 2 portions, reserve the stock for later use. • Discard half the lentils and blend the remaining at high speed for about 1 minute. • Chop the green chillies and onions. • Combine onions, ginger, coriander Seeds, garlic and cumin seeds together and make a fine paste. • In a pan, heat oil and add the mustard seeds till they crackle. • Add the chopped onion, green chillies and the curry leaves to it. • Fry until the onions are golden brown and then add the paste and cook for another 2 minutes. • Combine the remaining ingredients with it, mix well. • Now add the stock and the lentil paste to it and cook over low heat for about 15 minutes. 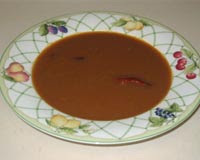 • Horse Gram Soup is ready to serve. Boil 2 cups of water and add spinch,onions and green chillis.Let it cook for 7-8 minutes.Cool and make a paste of it. Heat 1 tbsp oil in a cooking dish.Add cumin seeds and let them splutter. Now add the garlic and curry leaves and fry for 20 seconds. Now add the spinach paste,chilli pwd,cumin pwd,coriander pwd and salt.Mix well. Let this cook well till oil seperates.Keep stirring once in a while during the cooking process. Now add the boiled cubed potatoes and mix well.Add one cup water and cover and cook till you get the desired gravy consistency.Adjust salt. Add garam masala and garnish with coriander leaves. for 5 mts.Reduce heat to medium high and continue to cook till the oil separates and the tomatoes turn mushy.Towards the end of the cooking process as the oil seperates, reduce heat and keep stirring till the oil separates completely (the tomatoes could take a good 45 mts to an hour to cook). Turn off heat, add the tamarind and place lid.The tamarind will soften with the heat of the cooked tomatoes. Cool completely. Once cool, add salt and grind the cooked tomatoes along with tamarind to a paste. Remove onto a vessel. Add chilli pwd and methi pwd. Combine.In a pan, add 2 tbsps oil, add mustards seeds, methi seeds and fry till the mustard splutters and the methi turns red.Add the dry red chillis, curry leaves and saute for a few seconds and turn off heat. Add the crushed garlic and leave aside the tempering for 4-5 mts. Once cool, add this tempering along with oil to the tomato paste. Combine well. Cool and store in an airtight bottle. Refrigerate. 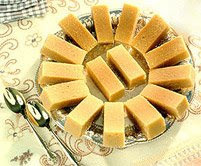 A combination of jaggery and sugar can be used. Take 3/4 cup jaggery and 1/4 cup powdered sugar. Mixture of black gram powder and sugar can be stored in an air tight container for 1-2 months. When ever required mix ghee and make balls.